Hands are complex with a considerable number of delicate muscles, tendons, nerves, bones, joints and blood vessels in a small zone. In addition there are specialised surface structures - the skin on the palm and the fingernails. Lacerations or penetrating injuries from glass, knives, and machines may damage any of these structures. Breaks and sprains are also common injuries from falls and sporting injuries. Specialist input from trained hand surgeons and hand therapists is often necessary to ensure the fullest possible recovery in a timely manner. Salvage treatment may also be required where poor function persists after initial treatment. Sometimes injuries have gone unnoticed or untreated for some time before a problem is recognised. Wounds on the hand should be assessed and thoroughly cleansed with irrigation within a few hours of injury. Surgical repair should be completed as soon as possible thereafter. Typically the best window of opportunity for repairing damaged structures is within a week of injury. If tendons or bones are repaired, it will usually be necessary to restrict daily activities, including driving, for 2-3 months after surgery. During this period, several specialist hand therapy appointments will be required as part of the treatment. 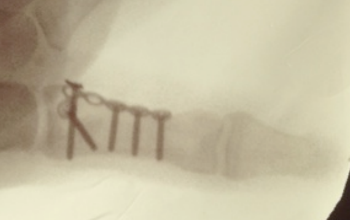 In many cases it is possible to treat broken bones without surgery but in many other instances it will be necessary to insert screws, plates or pins to effect a satisfactory repair. Repairing bones, tendons and nerves is complex surgery which requires significant experience to complete successfully. Acute injuries and longer term complications following injury are usually covered by health insurance schemes. It is usually but not always possible to schedule timely treatment for acute injuries. Complex fracture of the thumb treated with a mini plate and screws.